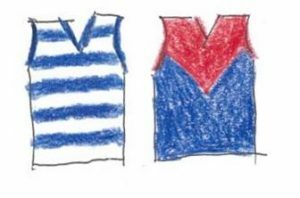 Round 18 – Geelong v Melbourne: Wow! What a Finish! Wow! What a finish! When McDonald goaled at the start of the last quarter I mentally gave up on the game. Melbourne had been too good, they’d exploited our weaknesses, overcome the home ground advantage, tagged Joel out of the game and made the decisive break half way through the third quarter. It was going to be another one of those frustrating games that the Cats “should” win but didn’t! But, something amazing, near miraculous, happened in the final thirty minutes. It had been pretty much goal for goal all game but after Jack Henry’s major at the 9 minute mark of the 3rd, Melbourne scored the next 5 goals and stretched the lead to 29 points. Henry did a good job playing forward with Henderson returning to the backline after a long injury absence. The star of the night was Tom Hawkins who received some silver plate service but also won groundballs and shook off tackles to goal around the corner. I love Hawk but confess that I’m often nervous watching him kick for goal. Not on Saturday night! He was on fire and kicked 7 straight including 4 in the last quarter. After the Dees 5 goal run the Cats finally goaled through Hawkins but I was still despondent, we were too far back! Melbourne kicked three behinds and looked like steadying but a desperate spoil from Rhys Stanley that denied Gawn in the goal square suggested the Cats hadn’t given up. I can’t praise Stanley enough, he’s copped lots of criticism and been dropped but in the last month he has clearly stamped himself as our number one ruckman and against one of the best ruckmen in the league I reckon he at least broke even and in the last quarter was huge as Geelong won the centre clearances 7-1. The crowd booed big Max after he went down like he was passing the grassy knoll from a soft bump by Tom Stewart. I know it was off the ball but this sort of stuff happens hundreds of times a game. The difference this time was Gawn milked it, got a free and kicked a goal so the crowd got stuck into him. Geelong have suffered from clangers and turnovers giving goals to the opposition all season but the unlikely culprit this week was Mitch Duncan. He is probably our most reliable kick so seeing him butcher the ball to give Melbourne two goals suggested it wasn’t gonna be our night. Hold that thought! The key to the Cats’ revival was 5 quick goals early in the final quarter. We were only two points down with ten minutes left to play. With every Geelong goal the crowd got louder and more excited which spurred the players on even more. Often a team fighting back runs out of time and momentum but not even two more goals to the Demons were enough to stop the tide. Melbourne moved the tagger from Joel to Danger in the last and the skipper stepped up as he so often does. His head-on clash with Nathan Jones in the desperate final two minutes would have sent you or me to hospital but they both bounced straight up and fought on. Tom McDonald kicked his second of the final quarter to stretch the lead back to 8 points but Hawkins kicked his seventh and the temperature in the ground reached boiling point. Melbourne scrambled a couple of behinds to lead by 4 points and it was hard to see us getting up but an accidental head clash with Kolo sent Gawn off with a blood rule and his absence was critical. Gary Ablett has polarised Geelong fans ever since he left for the Suns and even his return has not been universally welcomed but surely some doubters were finally convinced by his last quarter, 14 disposals culminating in the critical handball out of congestion to Tom Stewart that set in motion the final chain of possessions. At that point there were just 27 seconds left on the clock!! Stewart found Menzel on the wing and he channelled Stevie J with a lateral kick to the corridor for Hawkins to mark in the middle. The crowd were roaring by this stage. Hawk played on and handballed to Mitch Duncan. This was Mitch’s chance at redemption and he took it superbly, delivering to the unlikely hero-to-be Zach Tuohy 30 metres out. Every single person in the Hickey stand rose to their feet and stayed standing, breath held, hands clasped in “prayer”. Melbourne didn’t deserve to lose but when the Irishman kicked the goal after the siren, Geelong’s eighth straight in the last quarter, the Cats had got up by 2 points and the crowd went absolutely mental! I hugged and high-fived total strangers all around me, people were shouting and singing and shaking their heads and laughing and crying! It was sheer pandemonium, a heady mixture of rapture and disbelief. The Cats had gotten out of jail, winning on the back of belief and will and drawing on the crowd’s energy. After the wild celebrations the crowd sang two songs, the traditional “We are Geelong” and “Happy Birthday” to Tom Hawkins who grinned from ear to ear. Captured it really well Marcus. I couldn’t believe what I was witnessing. Sadly the Cats seem to perform well when they ignore the cosches’ Instructions and structures, and just go for it. The coach is the handbrake. Drove home from North Fitzroy listening to this on the car radio, and couldn’t get out of the car til the siren went. Unbelievable. They can always pull the ‘cat’ out of the bag. Well summarised. Marcus, you can say you saw history being made in this encounter. For the first time ever a side has beaten its opponent twice in one season, courtesy of the last kick of the match. In the opening encounter Max Gawn missed a shot after the bell; Geelong won. Here Zac Touhy goaled after the bell; Geelong won. Dunno about Melbourne ‘didn’t deserve to lose’, but they lost. If they were good enough they should have won but they didn’t. Good win by Geelong.